If you have your heart set on garden-themed favors or eco-friendly favors for your upcoming spring shower, we have some plantable baby favor ideas that are perfect for a spring shower right here. Plantable baby favor ideas are some of the best baby shower favor options to consider for a shower that takes place during the spring. Springtime is all about gardening, fresh air, and getting out and enjoying the outdoors. Even if you live in a warmer climate where you can enjoy nature during other times of the year, chances are your shower guests will be able to use and enjoy plantable baby favor ideas no matter what. Personalized Glass Favor Jar Seed Mixes—Customize these see-through jars with any text or graphic you’d like and then fill them with seeds, soil, or a pair of gardening gloves. Try stuffing 3 or 4 different packets of seeds inside or fill them with the actual seeds to give them a decorative touch. Your guests can take them straight home and use them in their own garden whenever they’d like. Biodegradable Seed Packets—There are countless baby-themed seed packets you can find that can be directly planted in the garden. Many of them are biodegradable, so you don’t have to worry about harming the environment. Some come in the shape of a baby carriage or rattle. Garden Watering Can Packages—If you have some extra time on your hands and you’d like to try a plantable baby favor idea that is a little more personal, try buying and assembling gardening water can packages for your guests. Dress up the watering can and fill it with everything your guest will need to garden, including seed mixtures or biodegradable seed favors. Your guests will appreciate the effort that is put into this type of plantable baby favor idea, and the decor it provides will complement your spring baby shower theme. 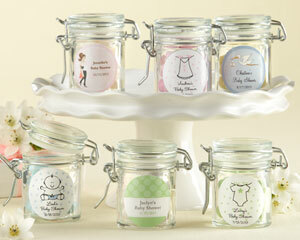 This entry was posted in Affordable Baby Favors, Baby Favor Boxes, Eco-Friendly Baby Favors, Popular Baby Favors, Practical Baby Favors, Spring Baby Favors, Unique Baby Favors and tagged baby favor ideas, baby favor jars, baby favors, baby shower favor ideas, baby shower favors, eco-friendly baby favors, plantable baby favors. Bookmark the permalink. Online prices, availability and offers are subject to change without notice. For all things baby favors.